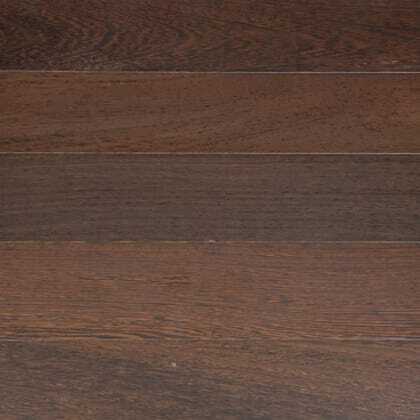 If you are looking for a dark wood flooring then Wenge might be the species for you. It has a very rich dark brown colour and shows some almost black streaks. Once a finish has been applied the flooring can look even darker (almost black) and this is particularly true with an oil-finish. Sourced from Central Africa, although it's not listed on the CITES Appendices, this species is endangered and therefore can be hard to find. 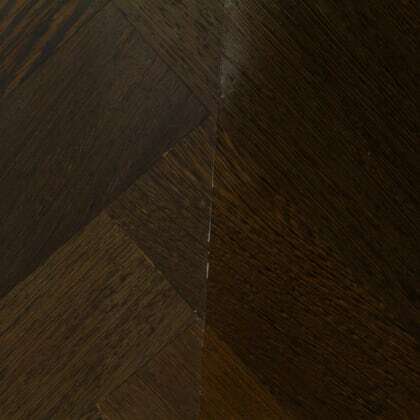 Fortunately, we have access to the largest range rare and exotic wood flooring in the UK which includes Wenge Parquet, Solid, Engineered and even Bathroom Wood Flooring. It can be pronounced both WHEN-ghay or WHEN-gii and is known for strength and hardness. This is why Wenge Floors are a popular choice to have in a home looking for a dark wood flooring and are often used instead of ebony. As it is a rare species using this flooring in your refurbishment will give you the exclusive look you may be looking for. Be the envy of your friends with a unique dark flooring perfect for the hallway, living room, bedroom and now even the bathroom. The KENS058-ENG Wenge is for those who appreciate the finer things in life, there is no substitute with the subtle nuances of woods rich grain and colour as you feel its warmth and character only available from an exotic species with a 2V bevelled profile on a multi-layered engineered structure. Special Order / Produced to Order Wenge is unsually dark with a straight grain with alternating dark brown streaks and paler veins, Wenga (also known as Millettia Laurentii) is similar to Panga Panga and has a very high hardness factor and is available in a engineered structure, as a protected species Wenga is hard to source and is produced to order with a Lifetime Structural Guarantee. Lacquered 2v Micro Bevel Select Grade Engineered T&G 15mm x 130mm x RL 1.00m2 coverage per pack (min order 5m2 to avoid surcharge) Also available in Unfinished or Oiled and in other plank siz.. The KENS058 Wenge is for those who appreciate the finer things in life, there is no substitute with the subtle nuances of woods rich grain and colour as you feel its warmth and character only available from an exotic species Special Order / Produced to Order Wenge is unsually dark with a straight grain with alternating dark brown streaks and paler veins, Wenga (also known as Millettia Laurentii) is similar to Panga Panga and has a very high hardness factor and is available in a solid structure, as a protected species Wenga is hard to source and is produced to order with a Lifetime Structural Guarantee. Lacquered Micro Bevel Select Grade Solid T&G 15mm x 90mm x RL 1.00m2 coverage per pack (min order 5m2 to avoid surcharge) Also available in Unfinished or Oiled and in 60mm, 68mm planks and wider plank size 120mm, 130mm and 140mm all to order. ..